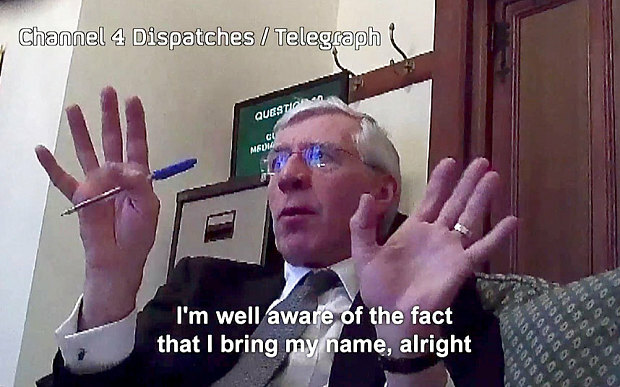 Jack Straw told the undercover reporters that he secured changes to separate rules governing sugar production in Ukraine and at a European level in Brussels, on behalf of ED&F Man, a British firm for which he is a paid consultant. The company, one of Britain’s largest commodity traders, has employed Mr Straw since 2011, with his earnings now amounting to £60,000 per year, paid in flat fees of £15,000 each quarter. In one case he flew to Kiev to lobby Mykola Azarov, the then prime minister, over the country’s sugar manufacturing laws, and in the other he travelled to Brussels to make ED&F Man’s case to a senior European Union official. His lobbying related to a sugar refinery owned by ED&F Man owns in the Mykolaiv region of southern Ukraine. Under a practice known as "tolling", raw cane sugar could be imported duty free to Ukraine in order to be refined and then re-exported during the periods that refineries would otherwise stand idle after processing the year’s harvest of locally-grown sugar beet. Mr Straw said false allegations emerged that the practice was being used as a way "to smuggle sugar free of VAT and customs into Ukraine". He added that "there was no evidence" for the allegations, but following the claims a law was passed to prevent them from tolling altogether, which made the refinery "completely uneconomic". Mr Straw then travelled with ED&F Man to Kiev to see Mr Azarov in September 2011. He was accompanied by Leigh Turner, the then UK ambassador to Ukraine, at the meeting, which he declared in his register of interests. He held subsequent talks with Mr Azarov in July 2012 when the Ukrainian prime minister visited Britain for the opening ceremony of the London Olympic Games. Mr Straw explained to the undercover reporters that Ukraine was seeking an association agreement with the European Union which would place the country on the path to full membership. "So ... I said to them, this was going to cause them lots of trouble with in Brussels if they were screwing other EU countries," he told the undercover reporters. Mr Straw’s account of his negotiations with Mr Azarov appears to be confirmed by a report of their Kiev meeting by a Ukrainian news agency. "According to Azarov, European integration is the main aim of the government," the report states. The reintroduction of tolling was opposed by Ukraine’s National Association of Sugar Producers, which said the move would simply "meet the local interests of individual companies". It insisted that Ukraine should simply grow more sugar beet instead of seeking to rely on importing raw cane sugar from abroad. However, the tolling ban was repealed in 2012, following Mr Straw’s intervention. "We got it sorted out," he said. But he added that it "took an awful lot of work". Following the change sugar producers in neighbouring Moldova complained that their trade was being "destroyed" by a "flood" of the substance being smuggled into the country from Ukraine. The Association of Sugar Producers of Moldova said in December 2012 that the overwhelming amount of sugar produced in Ukraine was partly down to the exemptions from VAT and the ability of Ukrainian producers to import cheap sugar from abroad. Mr Azarov, who resigned amid the wave of protests in Kiev in January 2014, is now wanted by Ukraine on charges of embezzlement and misappropriation of public funds. However Mr Straw insisted that he "wasn’t corrupt". The second significant intervention Mr Straw mentioned undertaking for ED&F Man was securing a change in EU rules on sugar trading – the "equivalence system". Under the EU scheme a firm was allowed to import and refine raw cane sugar from outside Europe without paying tax if it exported an "equivalent" amount of white sugar made from "raw beet sugar" from within the EU. However, white sugar is usually obtained from the sugar beet crop in one continuous process, so there is little production of raw beet sugar, a product which is only partly processed. The regulations, Mr Straw said, were therefore "screwing up the market". ED&F Man wanted the rules changed so that the sugar beet crop itself, rather than raw beet sugar, was named as the “equivalent” to raw cane sugar. "To cut another very, very long story short, and as I say, [Mr Straw’s parliamentary aide] did a lot of help, work on this too, I got into see the relevant director general and his officials in Brussels ... and we got the sugar regulations changed." Mr Straw’s register of interests shows that he travelled to Brussels on Tuesday June 4 2013 on a trip funded by ED&F Man, for whom, according to the entry, he was "undertaking consultancy". By October 2013 a new regulation had been drawn up which allowed firms within the EU to export white sugar made from sugar beet as the "equivalent" product to raw cane sugar. It came into effect the following month. Mr Straw’s entries in the Commons register of interests show a sharp increase in his work for ED&F Man between June and October. While he usually works between around 30 and 50 hours per quarter for the firm, the amount rose to 80 hours between July and September, before falling again to 45 hours in the final quarter of the year. Mr Straw declared his role with the firm in his initial letters both to Mr Azarov and the European Commission.